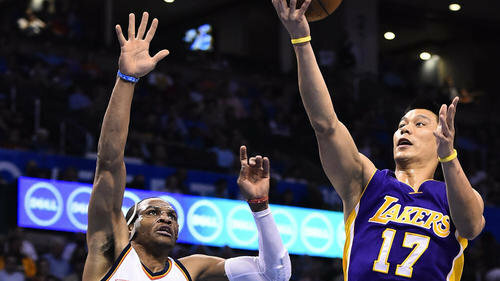 In the ongoing attempts to evaluate players heading into the offseason, Jeremy Lin got his starting role back from Byron Scott, resulting in a solid game from the point guard although it wasn’t enough for the Los Angeles Lakers, beaten 127-117 by the Oklahoma City Thunder. Lin finished with 19 points and 7 assists, actually playing for 30 minutes, getting to start next to Jordan Clarkson, who had himself a very good game with 30 points and 7 assists, although garbage time helped him pad up his stats a little bit more. Lin in the lineup might be something that lasts, as the Lakers are now trying to figure out if they want him for next season. Lin should have learned enough by now to stay away. The good thing about this from Lin’s perspective is the opportunity to put up big numbers, which always helps when one comes to a negotiating table, although you do expect the scouts and general managers in this league to be more than just the statistics everyone can pull off the internet. Watching him run this offense makes it quite clear that no one else should have been starting at point guard all season, with all due respect to the potential of Jordan Clarkson (a shooting guard) or Ronnie Price (a D-League player). As for the Lakers getting run over by the Thunder? The Russell Westbrook freight train is unstoppable right now, although there are ways to make him feel a little bit uncomfortable. Both Clarkson and Lin tried and weren’t able to. Having no interior defense or no plan whatsoever on the floor, as if this season is some one long training camp in which Scott watches scrimmages from the sideline and doesn’t intervene, didn’t really offer the perimeter defense any kind of support. The Lakers didn’t have too much trouble scoring, hitting 51.8% of their shots and scoring 58 points in the paint. However, no defense, something that has been consistent regardless of the lineup or rotations from Scott this season, translated into easy second chance points and 55.8% from the field for the Thunder, led by 27 points and 11 assists from Westbrook. That is what you get when any time a defender gets beaten the team has no idea on how to cover him. Maybe if the Lakers had any kind of help system in place or some sort of formidability in the paint while defending, opponents wouldn’t be attacking the rim at every possible opportunity. Westbrook isn’t easily deterred, but he had his way with the entire Lakers’ defense, and don’t let talk about Lin’s bad defense (a myth more than reality) fool you in any way. This was another one of those “acceptable” losses for the Lakers, although there wasn’t a single point during the game in which it was winnable for them. The Thunder opened a 10-point lead in the first quarter and held on for the win without too much trouble. With Lin in the lineup and hopefully with the minutes to go along with his new/old “role”, better basketball for both him and the team will come.